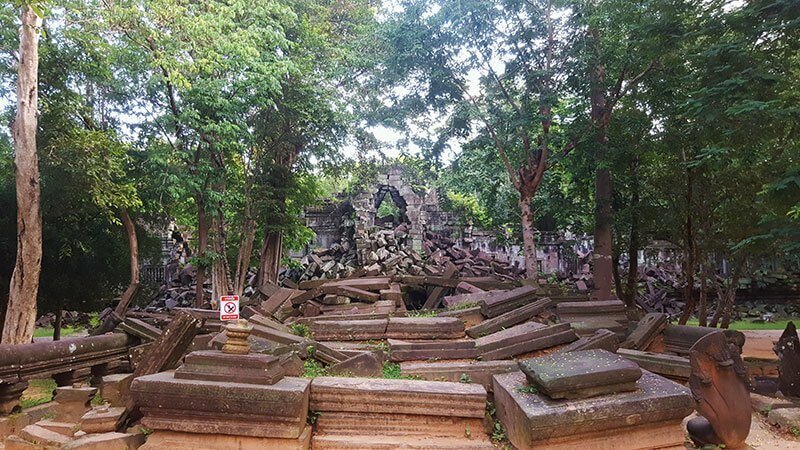 If you’re tired of dodging the tour buses while exploring the Angkor Wat temples, take a trip out to Beng Melea temple. 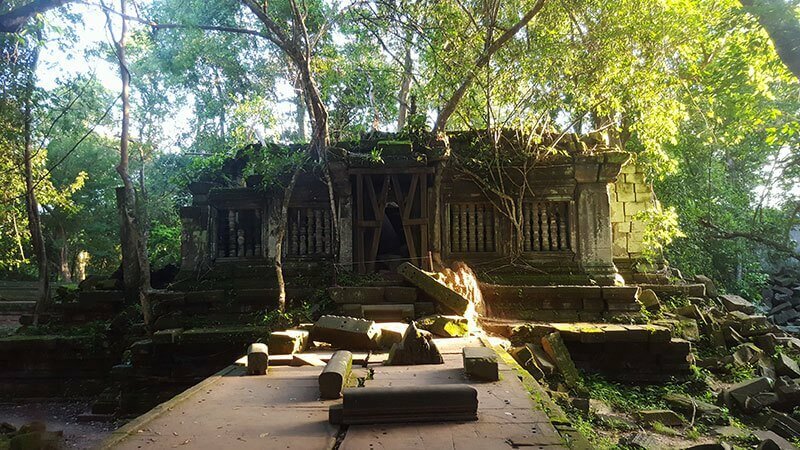 Situated 65km North East of Siem Reap, this forgotten gem is a wonder to behold. 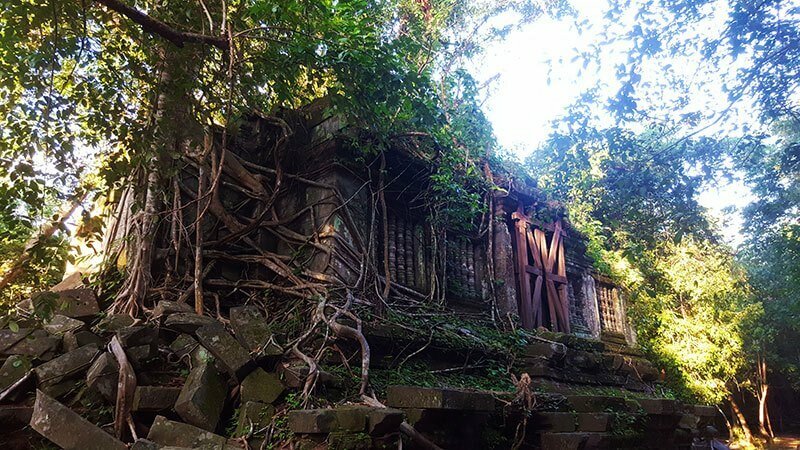 You’ll find tumbled down turrets, broken facades featuring intricately carved Buddhist designs, a coating of lush green moss covering the stones and walls and trees growing through walls enough to rival the famous Ta Phrom (Tomb Raider) temple. And there is virtually nobody else here! Built in the early 12th Century, Beng Melea, meaning “Lotus Pond” was given the UNESCO World Heritage status in 1992. Beng Melea temple follows the same floorplan layout as Ankor Wat and although on a slightly smaller scale, it is still a vast complex. 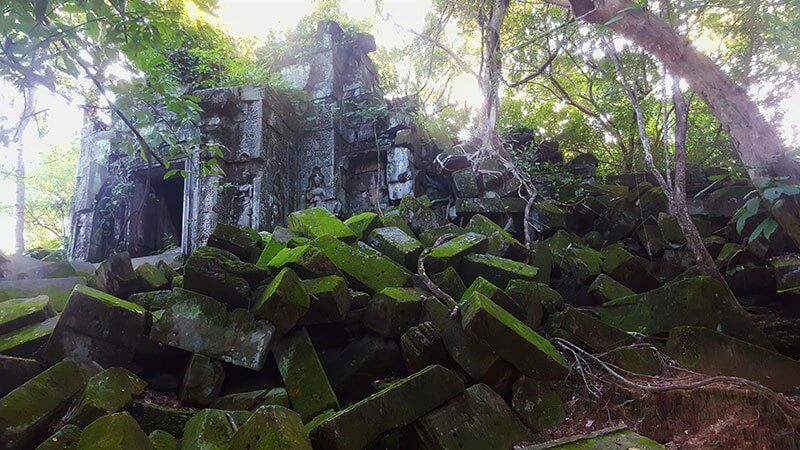 Thankfully, no restoration work has been done to the temple, so how it looked when the first explorers found it, is exactly how it looks today. Wooden walkways guide you through the maze of chambers and over crumbling sandstone walls, with many places where you are free to clamber over the chiselled blocks and feel your way through the dark underground passageways. Our fabulous guesthouse owner, Nini, offered to be our guide for the day and to drive us there. 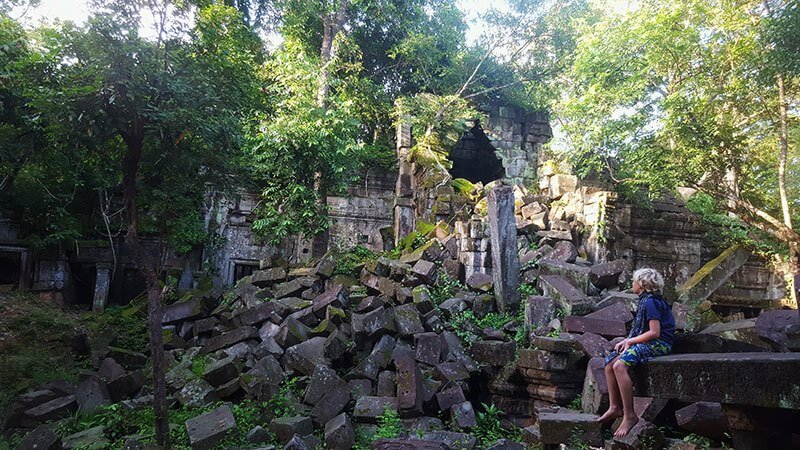 We left Siem Reap at 5am and got to the temple at 6.30am and there was not another soul around, save for some young boys looking after their cattle. We couldn’t believe our luck at having this most incredible temple complex all to ourselves for the entire 2 hours that we explored it. 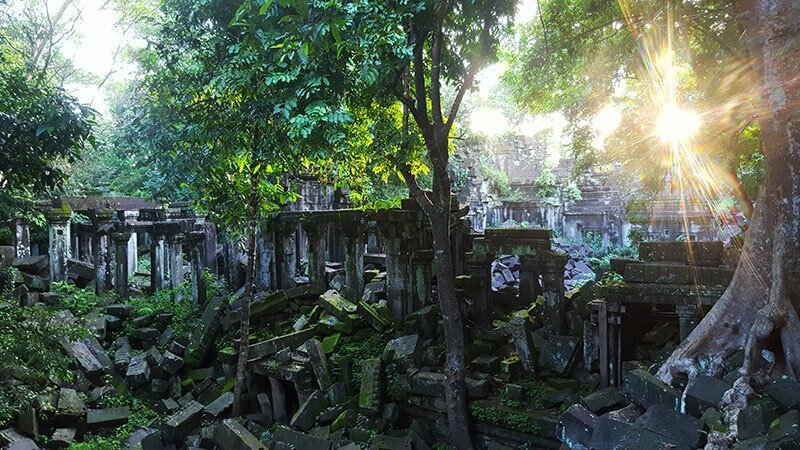 As the sun rose, the sun’s rays came dappling through the surrounding trees to flood the temple in the most glorious light. We found a hanging root on which to swing, where we sat quietly, listening to the birds chirping and the cattle lowing, in arguably one the most majestic places in the world. Next stop, breakfast! Nini took us to a local noodle shop for a typical Cambodian breakfast of noodle soup. The restaurant was full of heavily ornate wooden furniture customary in Cambodia, formal family photographs covered the walls and I was definitely the only female customer. According to Nini, lunch and dinner are cooked and eaten at home, but breakfast is eaten out at the local noodle shops. This is the time for the men to hang out over cups of coffee before starting their days. 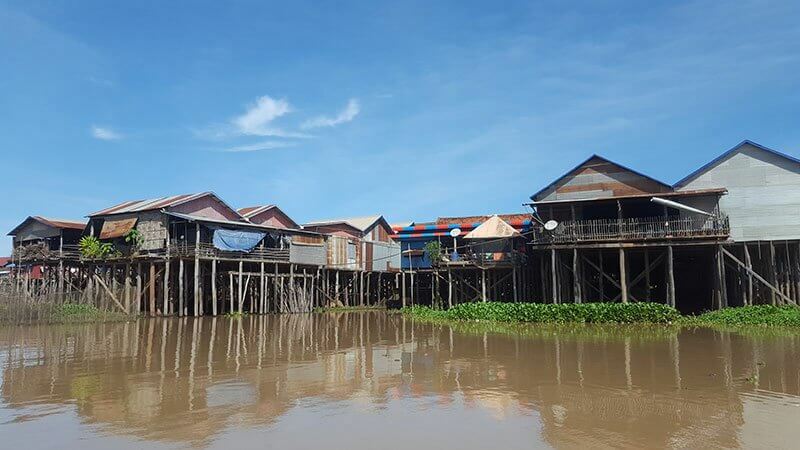 With full bellies, we headed South to Tonle Sap Lake and the village of Kampong Khleang, where we boarded a river boat and meandered past floating villages, high stilted houses and the locals going about their daily business, rowing along in narrow dugout canoes. I didn’t have any idea of what to expect before climbing aboard, so I couldn’t believe what I was seeing when we exited the tributary and entered the main body of the lake. The lake was huge!! There was just water for as far as the eye could see! Designated as a UNESCO biosphere reserve, the lake provides many biodiversities, with over 300 species of fish, over 100 varieties of water birds, as well as snakes, crocodiles, tortoises, turtles and otters. 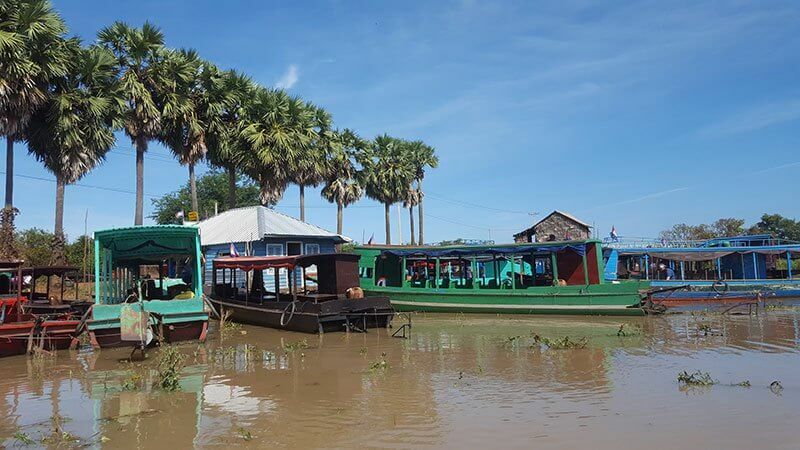 Tonle Sap is one of Cambodia’s most important commercial resources, providing more than half of the fish consumed in Cambodia. 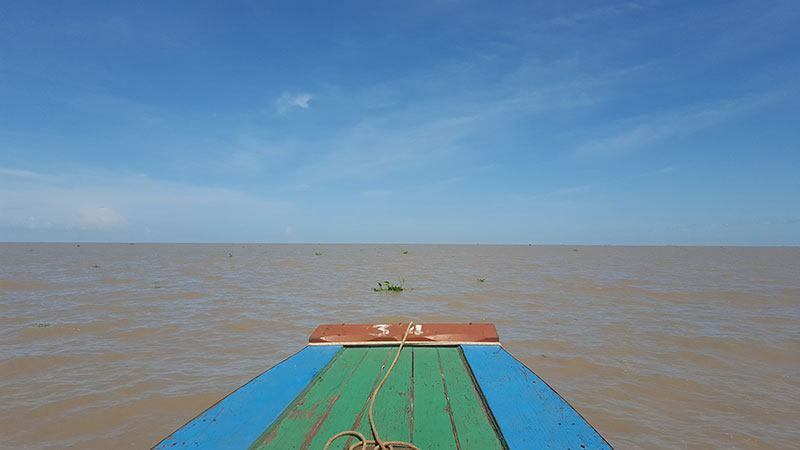 Tonle Sap, the largest freshwater lake in Asia, is a water wonder of the world, as it changes dramatically in size from wet season to dry season. During the dry half of the year, the lake shrinks to as small as 2500km2 as it drains into the Tonle Sap River and then empties out into the Mekong River. 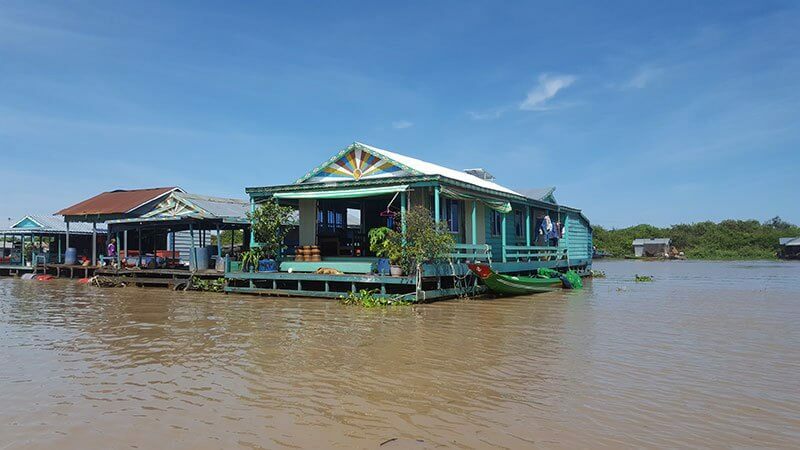 During the wet season, the strength of the Mekong River is so powerful that it reverses the flow of the Tonle Sap River and forces water into the lake, causing it to swell to 12,000km2. 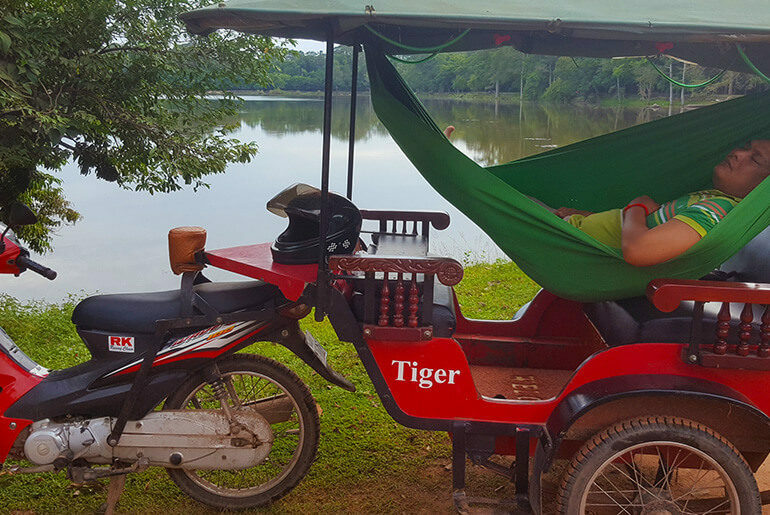 With both attractions ticket off our list, we headed back to Siem Reap. 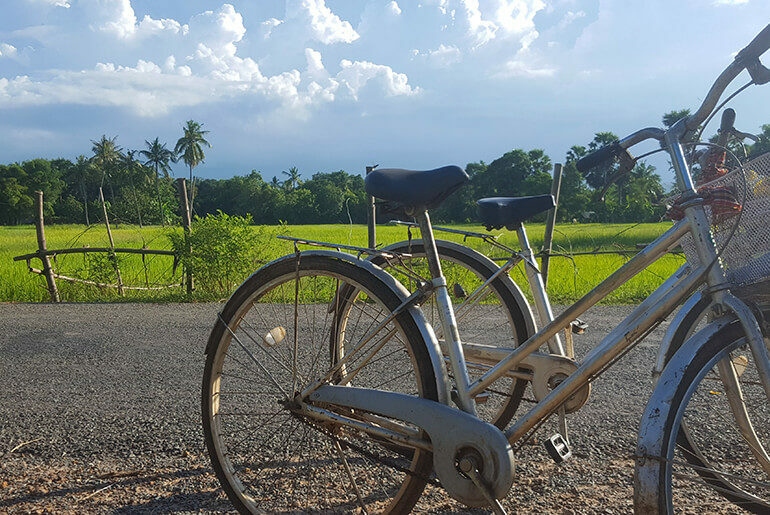 Another fabulous adventure full day in Cambodia! 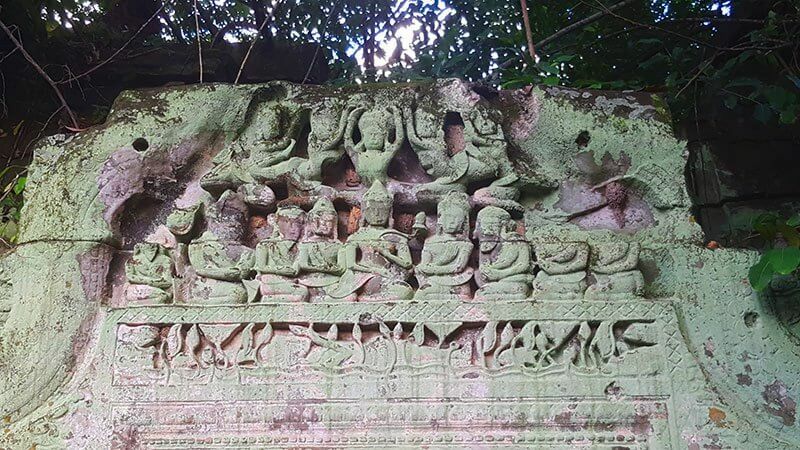 Beng Melea is not part of the Angkor Wat complex so you do not need an Ankor Wat pass to visit. It has its own ticket booth and charges a nominal $5 for a day’s pass. 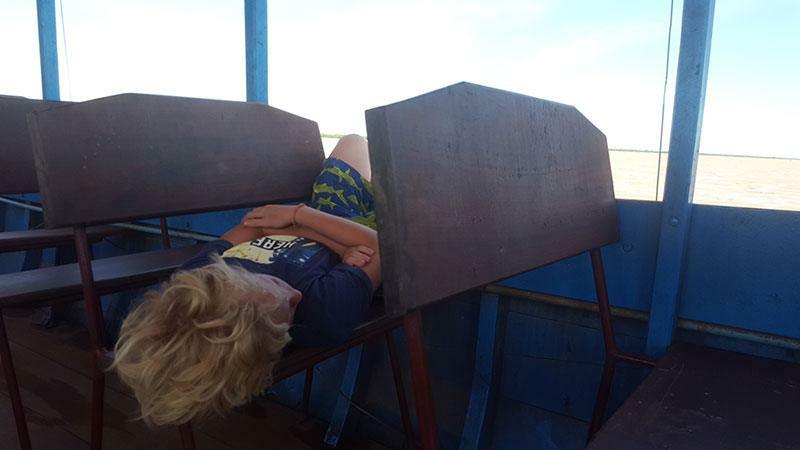 The boat trip usually costs $20per person, but Nini wangled a reduction for us of $15 each. For his time and effort in playing tour guide and driving us around for the day, Nini charged us $60. It took us 1.5hrs to get there by car. You could take a tuk-tuk, but it will take 2.5-3hrs and it’s a rather dusty drive. We stayed at the European Guesthouse, which was very reasonable, had big rooms and a swimming pool. The guest house over the road is also owned by Nini and the restaurant had some of the best food we tasted in all of Cambodia. I highly recommend that you have a pool wherever you are staying in Siem Reap. You will have very early mornings watching the sunrise at Angkor Wat and an afternoon dip in the pool to rid yourself of dust and sweat will feel like heaven! 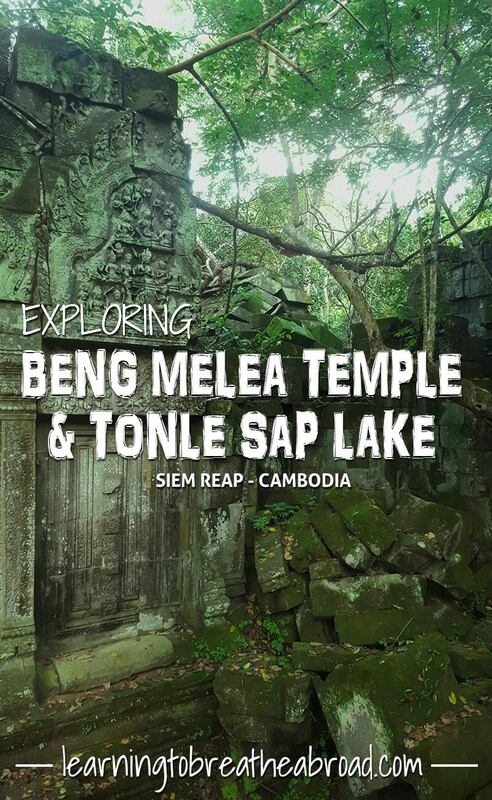 Beng Melea looks incredible! I love how it hasn’t been touched. I’ve been to Ankor Wat ten years ago and would love to return! There’s so much I love about Cambodia. What a gorgeous post! These temples have something of the genuinely mythic about them. I especially appreciated your practical info and logistical advice: we’re planning on a trip to Southeast Asia next year sometime, so I’ll definitely come back to your site. Thanks! Gorgeous post! These temples really have something of the mythical about them! I can’t wait to visit Southeast Asia sometime next year, and will definitely return here for advice. Thank you! Wow what a beautiful place, I had never even heard of it! Your pictures are incredible!! Okay, I’m not a biologist, but that seems like a lot of species of birds and fish! What a unique place. I absolutely love how Nature has merged with the sacred site, and I especially love the fact that there is hardly another tourist in sight to jump into. What a special experience, and I’ve noted the name down for my big Asia trip.